Selmer Thunderbird 50 Combo, courtesy of San Diego Guitars, USA. Selmer had nothing new to present at the late 1967 British Musical Instrument Trade Fair. In desperation they did a deal with the cabinet manufacturer to produce a new look for the existing models. Those bearing the MkII designation were called MkIIIs, but some of the early ones still had the MkII control panel. There was one significant change "under the skin" though - the introduction of Solid State rectification to the larger amps during this period. Dark grey/black, rather non-descript, grill cloth was used on the combos and the heads, with a strip of adonised aluminium complete with Selmer and lyre-shaped logos beneath the control panels. The exception to this seems to have been the T'nB heads, which for the 50 watt units had a full depth adonised aluminium facia from September 1968. The 100watt T'nB's and 100w PA's were produced in a brushed aluminium fascia / rack style format. Solid aluminium control knobs seem to have been introduced during the period, probably after September 1968. Selmer's replacement for the Little Giant. Although this amp adopted the name of the croc-skin amp which evolved from the Standard & New Standard, it bore little resemblance to it's predecessors, being a solid-state 5 watt combo with top front mounted control panel, black covering with white/black grillcloth. Size 16.1/2" x 7.1/2" x 12.3/4", single 8" speaker. 25 gns, or 29 gns with tremolo. The Mercury 5 seems to have been a short-lived model, only produced during the Black/Silver Period, as it doesn't show up in earlier or later catalogues. A new model name for a valve-driven 15 watt combo which was developed from the previous Futurama Caravelle model. It would appear that this was intended to replace the Constellation 14 (formerly the Stadium). However, the Stadium/Constellation was a hand wired amp, whereas the Vanguard inherited the Caravelle's much cheaper printed circuit boards. Strangely, the control panel was recessed into the top of the cabinet on the Vanguard, which must by then have been quite old-fashioned. As with the Caravelle, two-channels were supplied, each with tone and volume control, plus one reverb control which was new to the Vanguard. Size 14.3/4" x 23.1/2" x 9", single 12" speaker. Valve complement 3 x ECC83, 1 x 6BR8, 1 x EZ81, 2 x 6BW6. Price 39 gns. Another model which seems to have been produced only during the black/silver period. This amp replaced both the Twin Lead 30 and Twin Bass 30, hence earning its name "All-Purpose". With this new amp, Selmer had corrected the problems with overheating solid state rectifiers that the Twin Lead had suffered from, as well as providing a more suitable pair of 12" speakers. Cabinet size 29" x 10.1/4" x 24" with 2 x 12" Goodmans speakers (probably Audiom 61's). A single channel amp with two inputs and volume and tone controls, valve complement EL506 (2), ECC82 (2) and 2 silicon rectifiers. (The EL506 is an obscure valve, difficult to find nowadays. Its modern equivalent is a Model 7868 nine pin power pentode.) Priced to sell at a very cheap 75 gns. A new name for what, in effect, was the Taurus SS Combo from the Blue/Black period. A solid-state 60 watt combo in a modern styling with top front-mounted control panel in a black-covered cab with white/black grillcloth. Two channels, two inputs and volume/treble/bass controls for each. Reverb and tremolo on both channels, 2 x 12" speakers. Size 33" x 10.1/2" x 23" . A hefty 150 gns including cover and stand. Introduced September 1968, when the Taurus was presumably discontinued. Similar to the Zodiac Mk II in the Blue/Black Period, but different cosmetics. A Mk III version with solid state rectification did appear for a short time. Same as the Thunderbird 50 Mk II in the Blue/Black Period, but different cosmetics. A new addition to the range, which as the label says, was a standard T 'n B 50 Reverb unit incorporated into the top of a 2 x 12" speaker cabinet. For some reason, we can't find this particular combo in any of the Selmer catalogues of the Black/Silver period. That may account for why these combos are rare. Selmer imported Leslie Organ parts during the 1960's/70's, and assembled the organs under licence for sale in the UK. For a short period in 1967/68, they manufactured a combo amp for use with the organ. This produced the famous Leslie rotating speaker sound, but by means of a moving baffle in front of the speaker; not by actually rotating the speaker. We understand that one of these units was supplied to the EMI Abbey Road studios for use during the Beatles recording sessions. This version of the T'n'B is identical to the previous model apart from minor cosmetic changes, and the omission of the GZ34 rectifier valve in favour of 2 silicon rectifiers : some people consider that this detracts slightly from the sound quality. The shape of the cab was changed slightly so that the top front portion was slanted, but the control panel was otherwise unchanged. 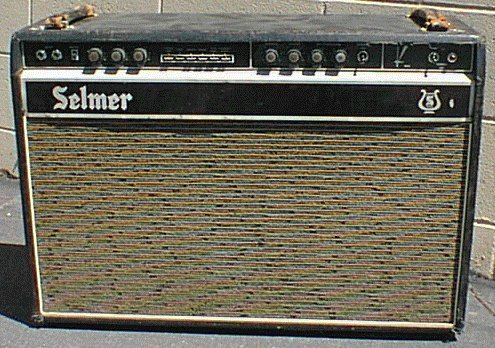 The grillcloth was omitted in favour of a black/silver aluminium panel covering the front of the amp, with large "Selmer" and lyre-shaped logos, although it appears that a few early examples were produced with a copper coloured front. A picture of one of these rare amps is included on the linked picture page. Priced at 60 gns including waterproof cover. A version of the above T'n'B 50 in a larger cab featuring footswitchable reverb on the normal channel, hence one extra control knob. Cabinet size 20.3/4" x 9.1/4" x 11.1/4". Valve complement EL34 (2), ECC83 (4), 6BR8 (1) and 2 silicon rectifiers. Price 75 gns. A combo version of this amp was also produced, fitted with twin 12" speakers - See Combo Section above. Basically the same, as the T n' B 100 in the Blue/Black Period.. Valves - 4 x EL34, 2 x GZ34, 5 x ECC83. Price: 93 gns.. This seems to be the final version of the fabulous Thunderbird, which was discontinued during the Black/Silver Period and transposed into a head and with the push button tone pre-selects and reverb of it's predecessor (but losing it's tremolo). Top front-mounted control panel in black cab with white/black grillcloth, large white Selmer & lyre logos. Two channels each with volume/bass/treble controls and reverb depth. 6 push-button tone presets. Size 29" x 9.1/4" x 11.1/4", valve complement EL34 (2), ECC83 (4), 6BR8 (1). 95 gns including cover. Identical to Zenith 50 head (black/white) but EL34 (4) giving 100 watt output. As with the Zenith 50, this appears to have been introduced when the Zodiac and Thunderbird combos were discontinued. This first version of the Super Zodiac was in the same styling as the very similar white/black T'n'B heads, but incorporated the push-button tone pre-selects which were a feature of it's predecessors, the Zodiac and Selectortone combos. Top front-mounted control panel in black covered cabinet with white/black grillcloth and white Selmer & lyre logos. Two channels, each with 2 inputs and volume/treble/bass controls, 6 push-button tone pre-sets and depth/speed tremelo controls. Size 29" x 9.1/4" x 11.1/4", valve complement EL34 (2), ECC83 (4) & 2 silicon rectifiers. Price 80 gns including cover. Introduced later into the Black/Silver Period in about 1969. Identical to the Super Zodiac 50 (white/black) except valve complement of EL34 (4), ECC83 (4) giving 100 watt output. Price 90 gns including cover. This seems to have been a very short-lived model produced at the beginning of the Black/Silver Period. It was probably discontinued in favour of the Zenith range. Single channel, two input amp with Hammond reverberation unit fitted. Push-button selector-tone, together with separate treble, bass and volume controls, as for Zodiac 100 above. We have now found a very similar Thunderbird 50 Head, but only in Blue/Black styling. Presumably this was the forerunner or even prototype of the Black/Silver T.Bird 100 head? The second version of the TV PA100 from the Blue/Black period. As previously this was a four channel amplifier for Public Address and Vocalist use, but now fitted with master volume control and echo send/return sockets on the front panel. The previous valve rectification was now changed to Solid State. Constructed within a metal cabinet, with white front and "D" handles. Two Selmer TV 4 x 10" Column Speakers were the designated units for use with this amplifier. This unit was developed in time for the 1968 London Trade Show. It had six channels, with reverberation on two of these. Two of the other channels had send/return facilities for external echo/reverberation. THE ALL PURPOSE 50 CABINET 2 x 12"
THE ALL PURPOSE 100 CABINET 2 x 12"
THE ALL PURPOSE 100 CABINET 4 x 12"